An Empty Outline is best used when a great deal of structured content must be presented, such as in a lecture. Varying levels of ability in students allows an empty outline to meet the different needs. An empty outline can help students develop skills of listening, note taking, and organization. All of these skills do require clear and supportive feedback at the same time. Beginning with a detailed outline lecture or discussion, decide whether students should pay more attention to its topics, subtopics, or supporting details (this might alternate with certain subject matter). Then, prepare a partial outline, omitting the topics, subtopics, or supporting details from it. After the lecture, ask students to fill in the blanks in the partial outline. Completing the outline demonstrates students’ mastery of the material and shows students how topics, subtopics, or supporting details relate to one other. An empty outline is also a valuable resource in teaching students how to organize notes when outlines are not provided. It is important to be cautious when choosing what to omit. It is recommended that an empty outline be limited to at most, half of the lecture or discussion. The same outline technique could also be incorporated into a “Book Look” activity when assigning students reading from a text. 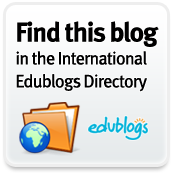 It's that time of year again where nominations for the Edublog Awards are happening across the blogosphere. I have missed out on opportunities in the past because of finding consistent time to post on my blog. If you are new to reading educational blogs and learning about educational technology, then examining the previous winners is a valuable resource for you. The winners go back to 2007. Being out of the loop has left me missing some new bloggers out there. So my nominations will focus on some of the ones I have liked over the past three years....from the time I started this blog. 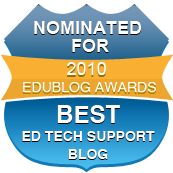 Best Resource Sharing Blog - Free Technology for Teachers - A staple in educational technology resource sharing. Best Individual Blog - Larry Ferlazzo Websites of the Day - Another long standing resource related to both educational technology and other education related issues. Best Open PD/Unconference - TeachMeet Kentucky - Being from Kentucky and both attending and presenting at this conference, I am a little biased. Best Mobile App - Remind 101 - An app I used when I returned to the classroom that allows users to set up text message reminders for students and parents. Best Educational Wiki - ICT Magic - Routinely updating resources related to educational technology. Best Librarian Blog - A Media Specialists Guide to the Internet - A valuable resource for educators looking for resources. Best Teacher Blog - The Nerdy Teacher - A valuable blog when looking for how a teacher integrate technology and think student first in education. Best Individual Tweeter - Jerry Blumengarten - Cybraryman1 - Has a great resource website too. Lifetime Achievement Award - Kelly Tenkely - Writer of the iLearn Technology Blog and a constant thinker about education and how to make change in education. Kelly has always been moving forward with thinking about how to improve learning for students. Is currently working on the Learning Genome Project. GetEdFunding, sponsored by CDW-G, is a resource for finding free and fresh grant opportunities. The site is dedicated to helping educators and institutions identify the funding they need when education budgets across the country are getting tighter and tighter. There are currently more than 750 grants and opportunities from various levels and organizations available to various levels of education. The grant opportunities are monitored, updated, and expanded on a daily basis. There are 6 criteria that users can search by, which include 41 areas of focus, 8 content areas, and 21st century skills. By creating an account users can save and organize the various grants of greatest interest. If your school or district is looking for ways to create opportunities and has an experienced grant writer on staff, this would be a valuable starting point for your district. Administrators looking to help their schools where funds are extremely limited would benefit utilizing GetEdFunding. As new grants are made available, you can easily find them on the main page and provides an easy way for staying on top of new opportunities. Another feature of the site are articles and resources related to educational technology. There are currently four resources available for free that might be of interest as well. GetEdFunding also allows searching by keyword, which would allow users to search for content and subject related grants and other funding opportunities. Finding valuable and unbiased information related to the election can often be a difficult task. One of my favorite websites that I look at and check back to every week is All My Faves. With the election right around the corner, information for before, during, and after the election will be important to educators across the curriculum. All My Faves currently has a page dedicated to Politics, The Election, Democrats, and Republicans. There is also information in each section dedicated to showcasing some of the most popular YouTube Channels and Twitter accounts. I highly recommend this as a starting point for student projects, classroom discussions, and other activities related to the 2012 Election.